Wednesday, September 9th- PACK RAT is delivered for Yard Sale! everyone else and their parents @ 3:30pm.Please bring an updated 2015-2016 medical form & insurance card. Pick up will be at 7:30pm. worship around a campfire. We highly encourage our new faces to attend this retreat to build relationships and to get the feel for what Catalyst is. Sign ups are open until September 20th. Friends welcomed & chaperones must fill out a registration form as well. If you would like to be a part of our design team for the trip (planning activities & worship), contact me today! is asked to participate with fundraisers. If you cannot participate with the sale day (October 3), you should help with prep (October 2). You can sign up for a shift here, and we are always looking for parent volunteers. Sign up today! please have your bathing suit on when you arrive. We should return to the sanctuary side parking lot by 7pm. Participants should eat dinner after pick up. This is one of the most important evenings on our calendar, and we hope that you all will be able to make it! The theme this year is "under the sea,"
change back into for worship. purposes. This trip will take place on September 25-27th at Stone Mountain State Park. We are able to run so smoothly throughout the year thanks to the help of such amazing parents! If you'd like to sign up to volunteer on our monthly rotation once a year, which is what we encourage, please go sign up on the google doc by following this link: It's really hard to do this ministry well without your help!! October 2nd- Yard Sale Prep--sign ups available at kick off! That just about covers it, y'all! Have a beautiful week. We will be meeting at 4pm instead of 4:30pm and will be done at 7pm instead of 6:30pm. the youth room at 4pm. Trip details: Next Saturday 8/29 we are taking our annual trip to Wet n Wild, Emerald Point! and will return to the sanctuary side parking lot around 7pm. or driving questions or issues, please direct them to our registrar, Stephanie Salus. 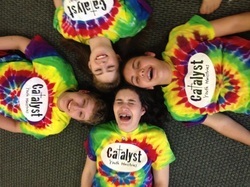 Stephanie can be reached at catalystyouthregistrar@gmail.com or 336-926-1210. You can also turn in forms and money to Stephanie in the black box outside of my office. SUNDAY is the last day that you can sign up to participate or chaperone for Wet N Wild. or email (noahloftinwilliams@gmail.com or 336-306-3937). with us on this! Please let me know if you have any questions. Thanks! for the year, so please make this night a priority. See attached form for our 2015 Fall Retreat. This trip will be to Stone Mountain State Park and all students in 6-12th grade are invited to attend. Please share with friends. Those wishing to chaperone should fill out this form as well. Chaperones will be chosen on a first-come, first-serve basis. This is our new way of keeping up with chaperones in a more organized manner. chaperone/drive for events/trips, send cards/make phone calls, etc. https://docs.google.com/document/d/1zPqt7Oa3Js5XdouBb69nVCfwkVKXUTop4iMHH0SMkLE/edit?usp=sharing! We cannot do it without you! Want to receive regular Catalyst updates via text?